Fed up with your yawn worthy hair and fancy trying out a new style this Spring? Why not try giving your hair a good old plaiting. Every season we see some sort of revival of the braid, but never more than in Spring/Summer 2010. It has recently been spotted on the catwalks in all sorts of shapes and sizes. Dishevelled, fishtailed, sculptural or even intertwined with ribbons. Whether you prefer it loose and messy or tight and preened, you can’t really go wrong. 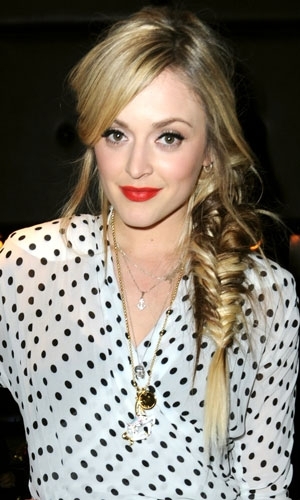 We know there are too many options to consider now so why not try a messy fishtail plait ala Fearne Cotton at the Brits. Our favourite fashionable presenter rocked the braided look with a gorgeous vintage looking polka dot dress and some bright red lippy, a look which Beauty Resource covet. -After washing your hair apply a generous amount of mousse before giving your hair a quick rough dry, this will create lots of body and will keep you plait in place. -Take small sections of the hair and sweep over to one side before pinning in place at the back of the neck. -Interweave the sections to create a tousled look and then with the bulk of the hair at one side create a loose wide plait, leaving three inches at the bottom and secured with a clear band. -Use the tail comb to then gently pull a few little strands from the front for a slightly messy look and then apply lots of hairspray.